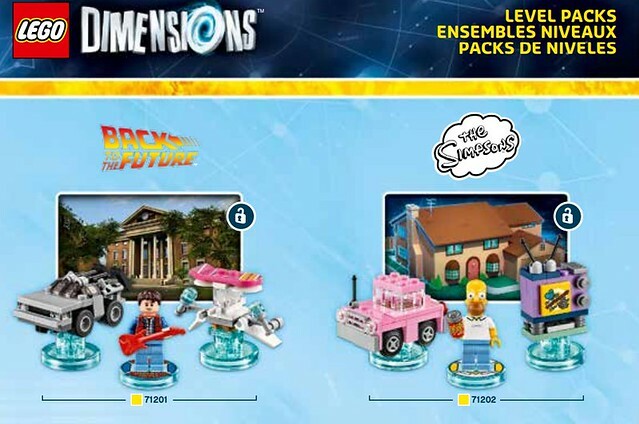 For some reason, five months ahead of its release, LEGO has published instructions for 71201: Dimensions Level Pack: Back To The Future. The building instructions themselves consist of just one step, building the minifig and mounting it on its base. Once done, you're asked to continue building using in-game instructions. 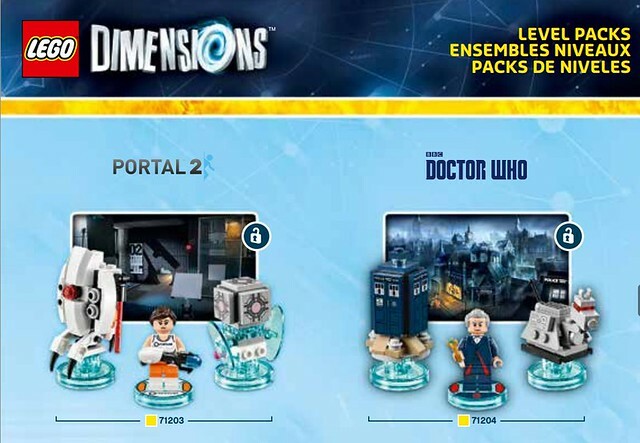 Far more interesting than that though, are images of other packs that will be available, some of which have not yet been officially revealed, including Doctor Who, Portal 2, Jurassic World, Scooby Doo and The Simpsons. Many thanks to Brickbuilder Bert for the news! Great to see some first images of the Doctor Who stuff - it looks fantastic! I think this is also confirmation of a Portal set, or at least I hope it is - why else would they make unique prints or a unique element, for that matter, in the portal gun. Very exciting! LEGO Ideas... Stealing your ideas since 2014! doctor who (K9!!!!! ), portal, and ninjago in one... three of my favorite things in my favorite toy brand bundled into one video game :O count my wallet in!! CAPALDI! THE EYEBROW LORD HAS RISEN! Now it shouldn't be too long before they reveal the Ideas set. Also, Portal opens up some new possibilities. Will their be a new Portal line? That would be interesting, especially considering the Cuusoo Portal project was left in limbo for so long and then eventually dropped. Portal has 2 models and 1 Minifigure. 2+1=3. HALF LIFE 3 HAS BEEN CONFIRMED GUYS!!!! Wow, entertainment holders are really keen to have their properties LEGOised. Portal 2 and Doctor Who images, great. I feel sorry for the Cuusoo (LEGO Ideas) authors of the portal, doctor who, and wizard of oz projects if their ideas got rejected then these come out. Holy cow Portal LEGO. How many gamers just passed out at their keyboards? Lol. These look pretty cool. Now I'm definitely more interested in this game. It's a crowded field there, though, what with Skylanders, Disney Infinity, and Amiibo. But honestly these have the edge. When you're done with the game, or even beforehand, you've got LEGO to play with! I'm still not interested in the video game ... but holy moley I want some of those sets. 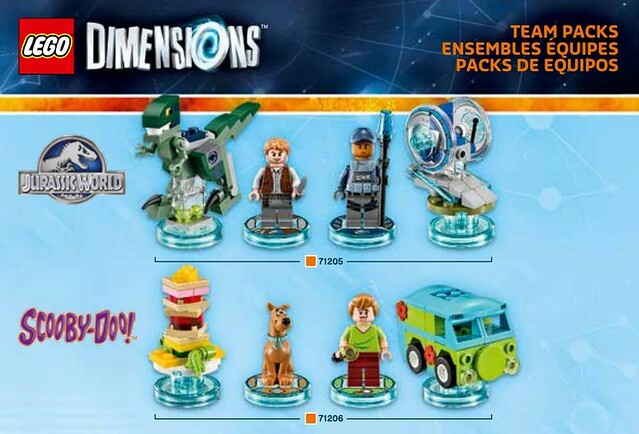 The Scooby/Shaggy set seems a given, as does the Doctor Who set (seriously, Lego's hit the goldmine with the Doctor Who license). The Wicked Witch of the West is unskippable ... and I want an entire legion of characters that Chris Pratt has played, so picking up that Jurassic World pack is a must too. It's rather interesting to see stuff like Wizard of Oz and Portal 2 in LEGO Dimensions, considering they were rejected on LEGO Ideas. All in all, I'm pretty happy about Portal 2 being confirmed. Hopefully they will be more they will actually make sets for it. And since that is the case, maybe LEGO will bring other rejected ideas to LEGO form whether it be in LEGO Dimensions or not. Wait wait wait wait wait. Portal? In Lego?! ... Does this mean Portal 2 sets are coming soon? I sure hope so. Wizard of Oz? Please give us an Emerald City set! So the bases for the two mini builds are counted as multiples of the same piece - I wonder how that works for bringing the vehicle etc into the game? Are they preprogrammed or do you download it to the chip when you start playing the game? Lego Ideas rejects submissions made by people who didn't hold the property license, and then make sets based on the property? Hopefully this will reduce the number of Ideas made about a license that the submitter doesn't own. There are no instructions for anything other than the figures...which means the game will tell you how to put together the rest. I love it. Homer has beer? ummm is that a Lego first? I mean we have whine bottles but, beer? Hmmmm..... So it looks like the bases count as the same piece....is the portal a little bit more than a chip reader....perhaps your builds matter in the game...not sure how that works. Level Packs $49.95 (BTTF only at the moment). That does not include Portal2, Doctor Who, Homer, Scooby or Jurassic lines. Once the game comes out, someone needs to make a recording of the on-screen instructions for those of us, like me, who just want to be able to build the mini models. Wow! So many different themes. Now Lego needs to get some Thunder Cats action in this game. I hope we get Capaldi in another set(s). Those Australian prices look OUTRAGEOUS. 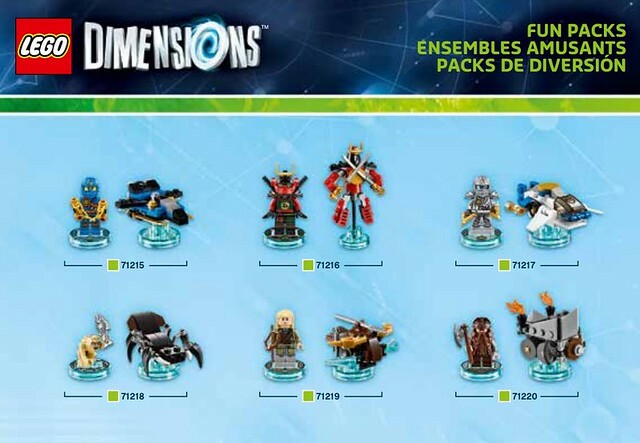 $50 for -- essentially -- a minifig and two polybags? I mean, I knew we'd get shafted (because Australian Lego buyers always do), but that's crazy. Forget you, Lego. I'm out. 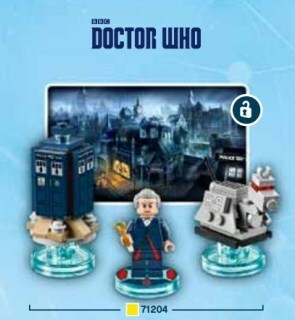 ^I think we can safely assume that this is not what TLG was talking about when they announced that there would be a LEGO Doctor Who set from the LEGO Ideas review. Seeing the new sonic screwdriver piece, I would bet that we could see a lot more DW sets. With that said, it looks like the Portal gun is a new part, so maybe there will be more than just this use of the idea. Never having played the game, I don't know what they could do with it. Chima will continue after the summer sets also. 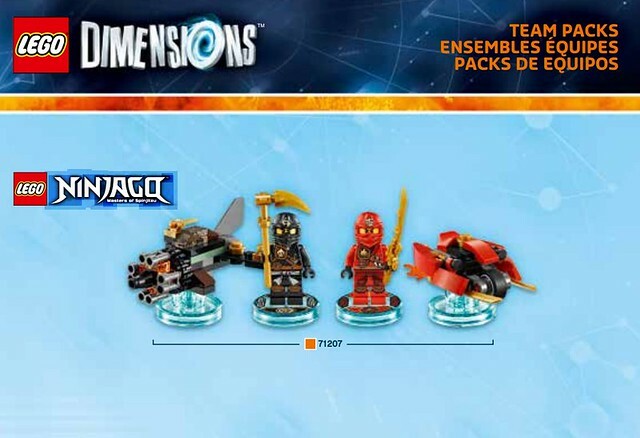 personally I would love to see more of the battle pack sets for Chima, with existing Tribes. The Doctors screwdriver and new hair mold 'suggest' that there may be more to DW than 1 Ideas set. Would they make a new piece simply for 1 or 2 sets? Isnt there a no new pieces rule on ideas? Either way on Saturday we saw the preorder for dimensions and was on the fence... Oh well..looks like the Kids Christmas present is sorted. and we have pre ordered infinity 3 for Star Wars. ^ 71210 is Cyborg, a DC character. So no, that doesn't mean any Marvel characters are likely to show up, although it would be nice if they did. Wow that Doctor Who set is amazing. And it would be perfect for a £5 poly bag, but I can't see myself handing over £20 for it. I really like the minifigs and mini-builds pieces are not glued together like keychains and magnets and you really can build it. Maybe, even if I don't wanna play or buy the game, I still can buy some of these packs if it's cheap enough. Now of course, I want a UCS GLaDOS. It's an idea that I honestly think works out best for one of both of us. Great! More packs that are awesome! What's also great is the fact that I haven't got a PS3/4 X-box 360/1 or a Wii U! Thanks Lego! The copyright notice for Doctor Who is quite interesting as it includes details of Daleks and Cybermen. 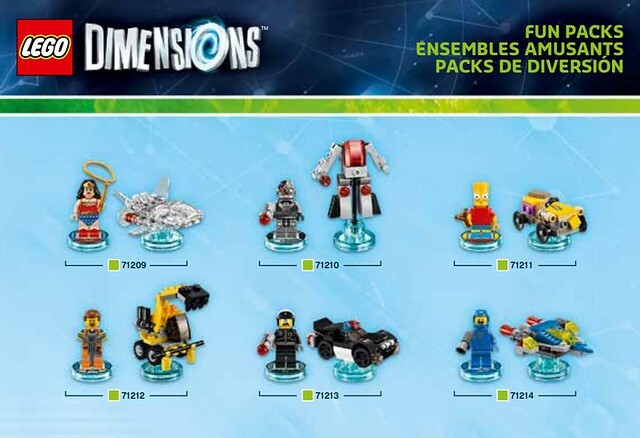 From this I would ascertain that we will see Lego Daleks and Cybermen, very likely in the game, but could mean Lego Daleks if and when more Doctor Who Lego is released. The BBC does not hold all the rights to all the Doctor Who monsters, therefore licensed products need to both licence Doctor Who from the BBC, but also need to licence Terry Nation (estate) for the Daleks. Good to see the first images of LEGO Doctor Who. But I agree with some other commenters, creating new pieces from an ideas project is definitely a first. I really hope the fact that they're making a special moulded piece for the sonic indicates a theme for LEGO. I told my friend about the Wizard of Oz Pack and he was super excited as am I for the Doctor Who stuff! However it is still very frustrating that by the looks of it, the only way to get K-9 might be to fork over AUD$40. We need Toy Story packs, ASAP. I can't breath. I am a a fan of doctor who and although I haven't played portal I'm still uber exited because 1: I plan on playing portal 2: It opens up a window for other gaming characters to appear. It would seem as though have now removed all of them? This morning when I clicked on the link it took me to the page and all of the instructions were visible, now the link gives a 404 page not found error. Guys you are mistaken about the moulds. They are most likely made specifically for the Dimensions project. Of course once they make them they will appear in the IDEAS set (reason for the set being in limbo earlier?). This whole Dimensions stuff must have been started at least 2-3 years ago. LEGO was in a desperate need of hoarding licenses since all the Disney stuff (Marvel, SW, Pixar, classic Disney, PoC) is denied from them since Infinity is a competitor. Probably it was decided early on that DW will be in the game thus they will create moulds. Once that was decided they iced the IDEAS project so they can release it with the moulds. As for them being appearing in sets: not all of these licenses are good set materials. At least Portal is not, but its gaming components are good fit to the video game and makes it more diverse. I am just saying so you don't get your hopes up too much. I don't play video games; so I have to pay £30 for something that would normally cost £5! DAMN!! I'm collecting all the Back To The Future, The Simpsons and Doctor Who sets so I'm looking at over £100! Has no one noticed the new Sonic Screwdriver part? I think that could mean they want to make a Doctor Who theme. They usually don't make new parts for Ideas sets, and they wouldn't make a new piece just for this set, and they made new Minecraft pieces after they made Minecraft a theme. This seems like a good sign. I think the Portal gun has new parts, so good luck to you Portal fans, too. And the Doctor has a new hair piece. @LordofLego plenty of people commented on the sonic screwdriver piece. Sure, that will likely now be used in the Ideas set, but I wouldn't get your hopes up over an entire theme. Well just because you see a part in the Dimensions set (ie sonic screwdriver) does that mean you will see that in the regular LEGO sets? Wil this replace LEGO's minifigure game? To me, the weird thing is that the new haipiece is not only exclusive in the pack so far (probably in a regular set in the future), but it should be more suitable for the Ghostbuster set for the character whose hairpiece was forced to change. Nesquik - Toy Story Dimensions packs will never happen. Disney Infinity = Toy Story. 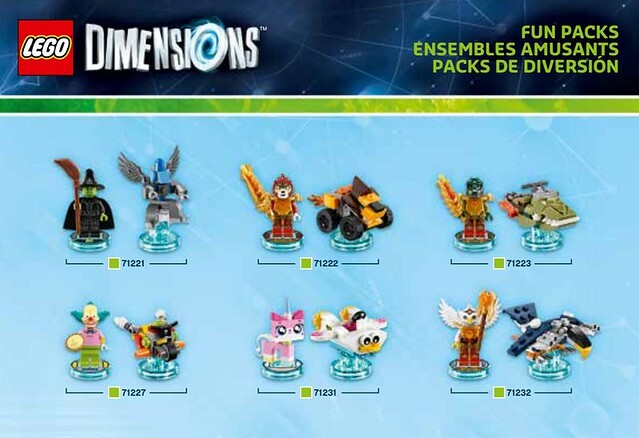 I am actually starting to worry that Disney will be angered by the competition from LEGO Dimensions and not renew their license with LEGO for the actual playsets and toy lines. The answer could be reverse. Excluding Marvel and Disney Princess sets, we don't really see LEGO do new single film licenses this year, such like Inside Out or Planes, which could show that LEGO do not having further cooperation with Disney. This could be owing to WB's interruption. Did anyone download the pdf files (preferrably the Doctor Who & Portal ones) before they were deleted? Wow, I didn't see Portal coming! Doctor Who is one thing, but... Portal? This opens up so many, well, dimensions! Also, LEGO Half-Life 3 confirmed. LEGO PORTAL 2!!! THE HYPE! So happy this happened. Everything looks great, especially the portal gun and companion cube. The dinosaur that comes with the Jurassic World pack looks vaguely like a xenomorph. Did anyone happen to download the instructions before they were removed? All of the links seem broken. Loving the Dr Who images. Plus portal, woot woot. Let's just hope S.Moffat doesn't do to Lego Who, what he's done to the show(MADE IT CRAP), before anyone asks. I've been a fan since 1973. Moffat is rewriting the past to fit his camp, naff vision of show. Female master come on.... ....? Any portal set looks great. Anyone think Star Wars will make a appearance?